William Morrow. Hardcover. 0380973634 Ships promptly from Texas. . Fair. 1997. William Morrow. Used - Like New. Like New condition. Like New dust jacket. William Morrow, 1997-07-01. Hardcover. Good. William Morrow. Hardcover. 0380973634 *BRAND NEW* Ships Same Day or Next! . New. William Morrow. Hardcover. 0380973634 *LIKE NEW* Ships Same Day or Next! . Fine. William Morrow. Hardcover. 0380973634 Remainder mark . Fine. William Morrow. Hardcover. 0380973634 . New. New York: Avon Books. 1997. F First American Edition. H Hardcover. Near Fine. A bright clean copy in pictorial jacket over cloth-backed boards, 8vo, , 337 pages. 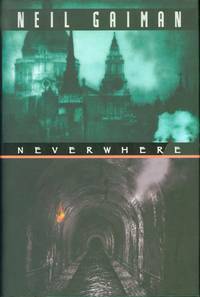 First solo effort of the famous co-editor of "The Sandman Book of Dreams"; a dizzyingly fantastic tale of a businessman's adventures in "a London of shadows and darkness ... a city of monsters and saints ... that exists entirely in a subterranean labyrinth of sewer canals and abandoned subway stations" (jacket front flyleaf). Notable also for quotations from the Lyke Wake Dirge, G. K. Chesterton's "The Napoleon of Notting Hill" and Neil Diamond's "I'm A Believer", as well as the map of the London Underground. William Morrow. Hardcover. 0380973634 BRAND NEW, GIFT QUALITY! NOT OVERSTOCKS OR MARKED UP REMAINDERS! DIRECT FROM THE PUBLISHER!|1.17 . New. William Morrow, 1997-07-01. Hardcover. Used:Good. William Morrow, 1997-07-01. Hardcover. VeryGood. 8.3000 inches 5.8000 inches. First Edition / First Printing as identified with ""1"" in the full number line. William Morrow, 1997-07-01. Hardcover. VeryGood. 8.3000 inches 5.8000 inches. First edition/first printing. Solid square spine, crisp pages, no writing or marks, no folded page corners. Dust jacket clean with no rips or creases. Not a remainder or book club edition. William Morrow. Hardcover. 0380973634 Special order direct from the distributor . New. William Morrow. Hardcover. 0380973634 Like New Condition. . Fine. (New York): Avon Books, (1997). First Edition. Hardcover . Fine/Near Fine. 337 pages. A man's journey through an alternate London underground searching for a way back to the 'real world'. First American edition (first printing). A fine copy in a fine dust jacket with a price written in red ink on the front flap. (New York): Avon Books, (1997). First Edition. Hardcover . Fine/Fine. 337 pages. A man's journey through an alternate London underground searching for a way back to the 'real world'. First American edition (first printing). Small oil stains to top corner of boards and inside jacket else a fine copy in a fine dust jacket.